The 9th annual Ole’s Ride is Saturday, Aug. 25, 2018. The event is in memory of Richard “Ole” Barten, who lost his battle to cancer in February 2011. Hospice of the Red River Valley cared for Ole during his last months, and the family wanted to use the event as a way to give back to an organization that cares for so many families in the area. All proceeds from the event benefit Hospice of the Red River Valley. The event starts on Friday, Aug. 24 from 6:30-8:30 p.m. with a bike show and pre-registration. 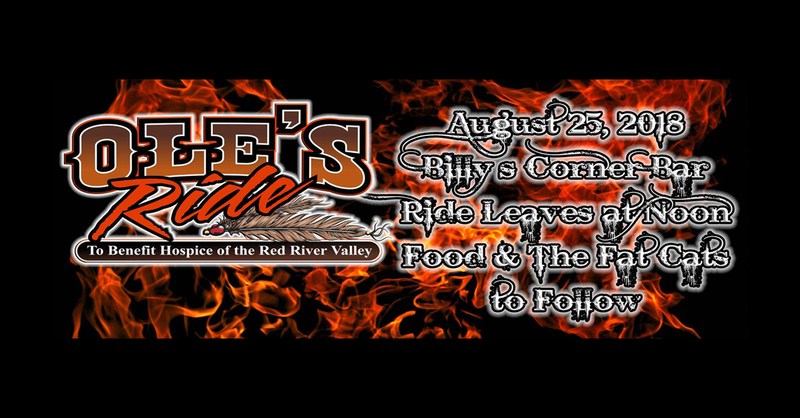 The ride through Minnesota lakes country kicks off from Billy’s Corner Bar located at 158 W. Main St. in Vergas, Minn., at noon on Saturday, Aug. 25. The cost is $25 per bike, $15 for an additional rider, and includes a T-shirt, meal and chances at door prizes at each stop. A meal, silent auction and live music by the Fat Cats follow the ride. To register for the ride, contact Jessica Sonnenberg at (218) 849-8995 or jessicasonnenberg@team-ind.com. For more information, visit the Ole’s Ride Facebook page.